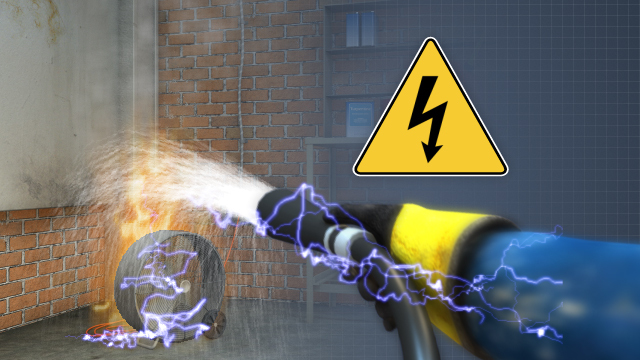 If a water extinguisher is used on an electrical fire, the water from the extinguisher can conduct the electricity, creating the potential for electrical shock. 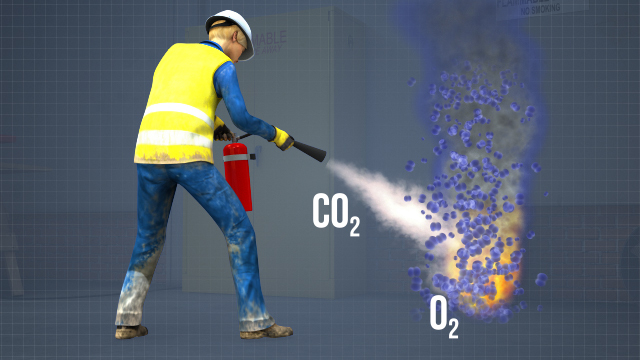 Even though the suppressant in a carbon dioxide extinguisher is cold when it is discharged it does not cool the fuel, instead the carbon dioxide displaces oxygen to put out the fire. 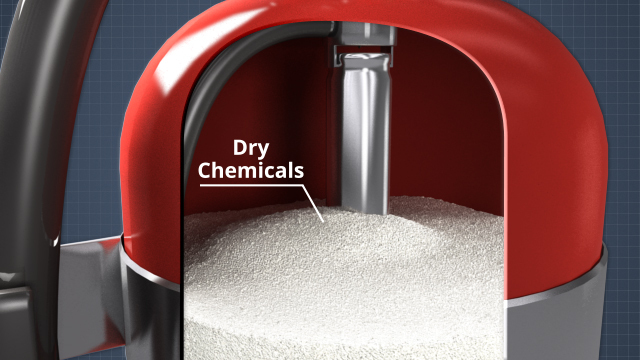 The chemicals in a dry chemical extinguisher are mixed with additives by the manufacturers to keep the chemicals from caking and make them resistant to moisture. This course is intended for Canadian-based companies and individuals and meets Canadian regulations. We see them hanging on the wall every day but most people know very little about fire extinguishers. Use this course to educate your team on the fire tetrahedron, the types of fires that can occur in the workplace, and how and when to use a fire extinguisher. 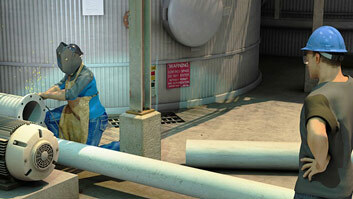 This course also describes when to evacuate and provides some proper maintenance tips for fire extinguishers. The four elements necessary to form a fire - heat, fuel, oxygen, and an unrestricted chemical chain reaction. What is the fundamental aspect of all fire prevention? Keeping the different elements of the fire tetrahedron separate - most notably, fuel and/or heat, since oxygen is in our air. What are effective and recommended methods of preventing fires, reducing fire damage, and avoiding loss of life due to fires? 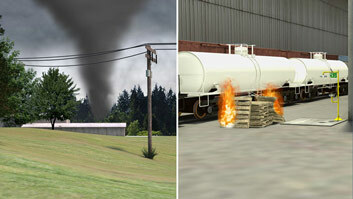 The use of fire sprinklers, fire detectors, alarms, and evacuating in the event of a fire. When the fire is small, and only by those trained to use the extinguisher. 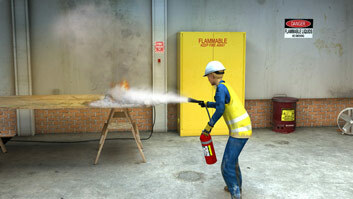 What is the key fire extinguisher training method taught? Use the PASS method - pull the pin, aim the nozzle at the base of the fire, squeeze the handle, and sweep the extinguisher. What are the five types of fires? Type A fires involve wood, paper, cloth, rubber, and many plastics; type B fires involve flammable liquids such as oil and gas; type C fires involve electrical equipment; type D fires involve rare metals, such as magnesium; and type K fires involve cooking oils and fats often used in commercial kitchens. Can you use any fire extinguisher to put our any fire? No, always use a fire extinguisher that's rated for the type of fire (A, B, C, D, or K) that you're trying to put out. What should you do if you or someone you know catches on fire? Stop, drop to the ground, cover your face with your hands and roll around on the ground, and try to use something like a blanket to extinguish the flames. 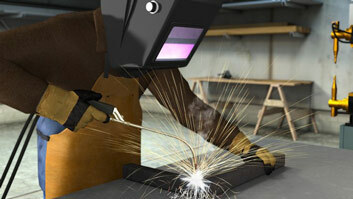 Aqueous film-forming foam extinguishers, or AFFF can be used on class A and class B fires. These contain a mixture of AFFF concentrate and water, and have a special nozzle that aerates the foam solution as it is expelled. The tank is pressurized with compressed air or nitrogen. 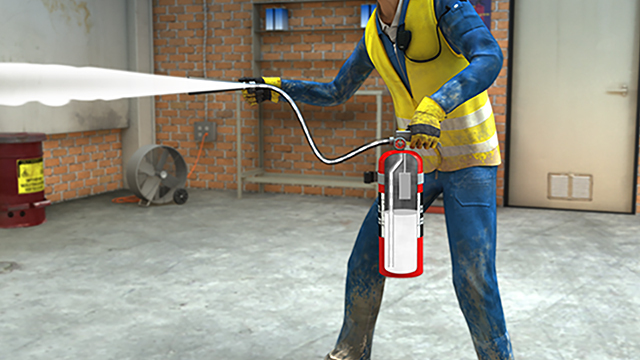 When using this type of extinguisher, the foam should be rained down onto the burning material to create a blanket of foam to smother the fire and suppress the vapors.